Die Wohngemeinschaft i Köln, Tyskland: Bestill nå! Welcome to the hostel die wohngemeinschaft. The hostel for special live-in experiences in Cologne`s creative center, the Belgisches Viertel. Feel like you`re at home in one of our 16 rooms, which are unmistakably unique and full of charming details. The Wohngemeinschaft isn`t just a hostel but also a cafe-bar as well as a theater. We are conveniently located amongst other Bars, Clubs, Restaurants, small shops, Galleries, Theaters and much more. Even native Cologne-ites will envy your good times. Whatever your heart desires, you`re in the right place! Make yourself at home in one of our eight rooms. Each one has its own character and charm. You can choose between the glitz and excitement of Bollywood cinema, the austere beauty of a cabin in the woods, the adventure of a boat-bed, amber-bejeweled decadence fit for a princess, the anticipation of the theater`s red curtain, the innerworkings of a poet`s psyche, a stylish photo studio, a 60`s mod chill pad and many more. We offer two-, three- and four-bed rooms, as well as a dormitory-style accommodation. 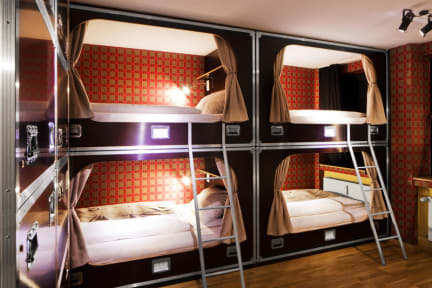 This accommodation has extra wide (140 cm) beds, as well as curtains and lockers for your privacy and belongings. The hostel is located on the top floor of the same building as the Wohngemeinschaft bar. A spectacular view over the rooftops of the Belgisches Viertel (Cologne's Belgian Quarter) awaits your arrival. The Belgisches Viertel (Belgian Quarter) is Cologne's hippest neighborhood. Full of boutique shops, cafes, clubs and restaurants, there is always something to see, buy, experience and enjoy on the neighborhood's many streets, plazas and meeting points. Use the Wohngemeinschaft as your starting point for exploring the entire city: take a walk to the Dom (Cologne's world-reknown cathedral), visit one of Cologne`s many museums or have a picnic in the park. Most of Cologne`s attractions are reachable by foot, and for those that aren`t, there is a fantastic public transportation system waiting just outside the door. For those inclined to a more participatory form a transportation, bikes and longboards are also available for our guests. In our cafe on the first floor, we will spoil you with delicious coffee and wonderful pastries. In the evening, the cafe is transformed into a bar and is one of the most popular places for people of all sorts to come, hang out and enjoy the relaxed, upbeat atmosphere, friendly staff and wonderful drinks, like our signature beer (WG-Braeu), South African Springbock or a Vodka-Melon cocktail. Daily-rotating DJs provide the perfect aural accompaniment to the evening`s festivities. In our theater, we proudly offer a diverse program of concerts, readings, plays and films. The intimate venue is big enough to seat seventy and showcase both local acts, as well as international gems. The theater`s carefully curated offerings present a nice complement to the city`s diverse attractions. For whatever you`re planning, the Wohngemeinschaft is the right place to start. I was happy staying here. There's no kitchen guests can use, but they serve an excellent home-made breakfast. The staff is very helpful and there's a nice common room where you can meet other travelers. If I return to Cologne, I will definitely return to Die Wohngemeinschaft.